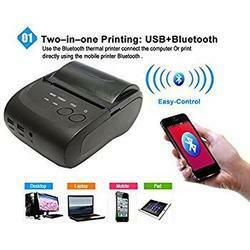 Manufacturer of a wide range of products which include goojprt pt - 210 58mm bluetooth thermal printer portable wireless receipt machine for windows androi and android bluetooth printer. Say goodbye to the traditional dot-matrix printer, now, we have more high-efficient and portable printer for you! This GOOJPRT PT - 210 mini Bluetooth thermal printer sets light weight, excellent connectivity, and long battery life in one. Handheld data printing makes it successfully applied to a variety of fields. The printer can be powered by the rechargeable battery. Compact design allows you to put it in the bag to use easily anytime you want. Small size and light, which is easy to carry for out working, such as the taxi bill printing, administrative fees receipt printing, post receipt printing, restaurant ordering information printing, etc. This GOOJPRT PT - 210 mini Bluetooth thermal printer sets light weight, excellent connectivity and long battery life in one. Handheld data printing makes it successfully applied to a variety of fields. The printer can be powered by the rechargeable battery. Compact design allows you to put it in the bag to use easily anytime you want.